One of four channel catfish caught and released during a quick 2 hours at a local pond. The morning after a holiday can be pretty enjoyable if you aren't nursing a hangover. I was kept up a little by the sound of fireworks (probably not legal ones) on the Fourth of July, however, as I was leaving my abode on 8th Street at 3:45am, there was not a soul in sight or noise to be heard. Like I've said, for me, fishing in July and August is about hitting the water before the sun establishes itself in the sky. This time around, I was actually crawling back into bed before 7am. I picked Chris up at 4, and only having a 15-minute ride to our local catfish pond, our lines were in the water and our headlamps were blazing by half-past. The reels started singing shortly thereafter. This would be my third trip to this pond this year and my third successful one at that. In the time I have spent there, I have learned a very important fact: it's not really up to me when the fishing is over, it's up to the turtles. This pond is loaded with channel catfish, carp and I'm assuming a few largemouth bass. It's also loaded with turtles. The catfish tend to bite readily in the morning, however, once the turtles get a whiff of the chicken liver, they show up en masse and clean the bait off before the fish can find it. There is usually a couple solid hours of fishing before this happens, but once it does, it's time to go home. 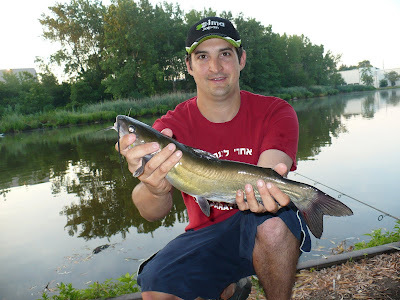 I landed four catfish before our time was up and had a few other run-offs that didn't connect. Chris had a few runners, but no fish. My hook-up percentage has been pretty solid with the channel catfish this year. This is what has been working for me. Terminal Tackle:1/4-ounce egg sinker, glass bead, Tsumani 75-pound barrel swivel, 14-inches Mamoi Hi-Catch 30-pound monofilament leader topped off with a #8 Gamakatsu treble hook. The Okuma Epixor 20 Baitfeeder was the only one I could find that was small enough for freshwater applications. I'm normally not an Okuma guy, but this reel is pretty sweet. I recently just found another one on overstock.com, and I'm glad I did, because I don't think Okuma is making them anymore. Not sure why, they rule. First-off, I NEVER use the whole liver. I cut it with an old bait knife down to a more manageable size and firmly plant it using all three points of the treble. The short leader and light weight is key, because a heavy weight or a long leader makes casting difficult. Also, when casting, a fluid motion will help keep the liver from flying off the hook. It will inevitably happen a few times, but I've found the treble hook, short leader and smooth casting motion prevents it from happening often. I use two rod holders to keep the rod parallel to the ground. With the baitfeeder on a light tension, even wary fish will find little resistance and can run freely with the bait. Once the reel starts singing, it's time to set the hook. I've been using this set-up for catching catfish in still water and it's been working well, at least until the turtles show up. May I know the location of this lake? I'm looking for a good channel cat spot.